Velvet Pipe Tobacco utilizes sun-ripened Kentucky burley premium tobaccos to deliver a mild, fragrant smoke slightly sweetened with a hint of anise, making it surprisingly flavorful. This high quality tobacco is rich and well-balanced with plenty of complexities, as an aged product. Velvet Pipe Tobacco is unique that it delivers a mellow fruitiness with a slight peppery undertone, giving off a classic room note with silky clouds of smoke. Velvet Pipe Tobacco only seems to get better when prepped and smoked properly. Milder and naturally velvety-smooth and sweet, Velvet Pipe Tobacco is a solid burley blend you'll go back to time and time again. Velvet Pipe Tobacco is distributed nationwide by Scandinavian Tobacco Group, Copenhagen, Denmark. Each pouch of Velvet Pipe Tobacco are available at our online tobacco store in unique styles to choose from. Currently available: Regular and Aromatic flavors. Our online premium tobacco store offers great deals and inexpensive ways to save money on over-prices retail brands. 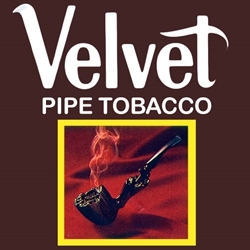 Velvet Pipe Tobacco can be the right choice for your pipe smoking needs. Here at Smokers Discounts we’ve made it easy and affordable to buy pipe tobacco online. Call us for more details!